It may seem the fairy godmother had a hand in this remodel — the transformation was almost as radical as a frog becoming a prince — but that would have been wishful thinking for owner Clark Fagot. Instead he paid top dollar, in the literal sense, to remove the core of his modest-size, single-level home in south Eugene and reconstruct it with Northwest woods and a boxy but daring second-floor master suite oriented for window light and city views. Fagot declines to say how much the remodel cost, but declares “I’ve never had a moment of buyer’s remorse.” The 42-year-old video game programmer attended schools in this 30th-Avenue neighborhood, graduating from South Eugene High School in 1985, and he’s grateful for its lifestyle conveniences. If ever a little house needed to sprout wings for a breezy new interior, it could be this one. In fact the original 1,200-square-foot home had such a low-slung roof with dark overhangs, made all the more gloomy indoors by soffited drop ceilings, it was almost like living in a cocoon. A cramped cocoon at that. The little galley kitchen was separated from the diminutive dining room, and a slim hallway — just beyond 2 feet wide — made for dim passage to three small bedrooms and the home’s only bathroom. And yet, when Eugene architect Nir Pearlson arrived on the scene, hired by Fagot to remake the home, he took cheer in certain of the little abode’s mid-century modern features. He especially loved how glass-block columns illuminated the cozy front entry, how a slight butterfly roof graced the one-car garage, and how ’50s charm still shone through various fixtures and surfaces. “We definitely took modernist cues that existed in the house,” Pearlson says in explaining his plan of attack for remodeling the core of the original house and adding 750 square feet of soaring new space above. The trick, he adds, was to “liberate” the mid-century modernism elements with livability luxuries relished in today’s Pacific Northwest homes, namely generous window light, native woods, taller ceilings and enduring craftsmanship. Once work began, the project was nothing short of major surgery for general contractor Nick Russo. Building up on a modest, older home gets spendy. Complex structural elements — reinforced foundation, load-bearing framing — must be retrofitted to support the new second floor. Contractor Russo allows the remodel “makes a pretty strong statement” in what he refers to as a post-war neighborhood built during the dawn of mass-production tract housing. But the rebuilt house would fit right in with neighborhoods in his native Bay Area, Russo says, and he expects to see more of such bold additions as buildable land becomes scarce in Eugene. The new day in Fagot’s home starts with brighter living. Upstairs and down, ceilings capture an Oregon essence with hemlock decking atop exposed Douglas fir beams. Most floors in the home are now white oak, and recycled fir — milled from old bleacher seats — makes for window sills, door casings and rails on the new stairway. Upstairs, the open bedroom suite has luxuries like a jetted soaking tub — sitting out in the open all on its own — next to a modernist gas warming stove. A “wet zone” swath of slate extends from the tub to a bathroom adorned with travertine tile and glass-block shower. Lofty windows illuminate the suite, with views extending east to the south hills and west to Amazon Park. For lounging around on sunny days, Fagot can step from the suite’s home office onto an 8-by-10-foot outside deck. Downstairs, a radical new grand space combines kitchen, dining room and a modernistic, wide-open reverse stairway where a bedroom had been. Taller ceilings help brighten the living room, which also now merges with the grand space. The rebuilt kitchen preens with brushed-metal appliances, beech cabinets and luxurious granite countertops. New built-ins include a work island and pantry. Pearlson made good on his promise for modernistic cues with clean lines and exposed structures, such as the ceiling beams, which extend outside of the home for sheltering eaves. 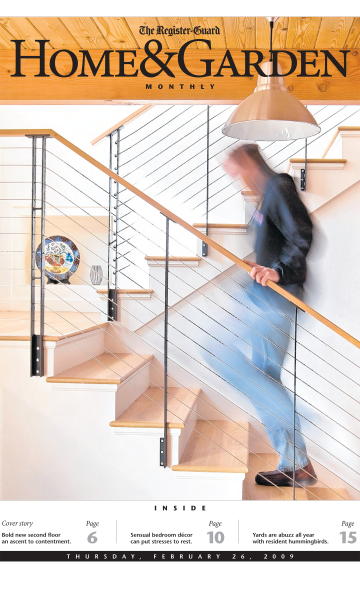 The new, wide-open staircase also is a bit stark with steel cables in place of balusters. Windows upstairs have no wood framing, other than the sills, for a so-called sheetrock return.